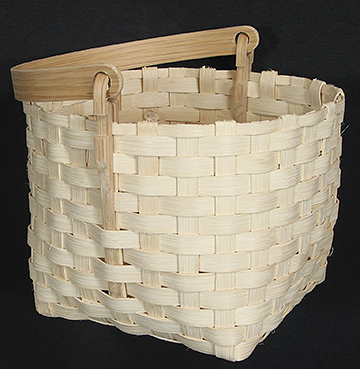 The Kentucky Berry Basket was created by Scott Gilbert for the Kentucky Basket Association Newsletter, Reed and Cane. 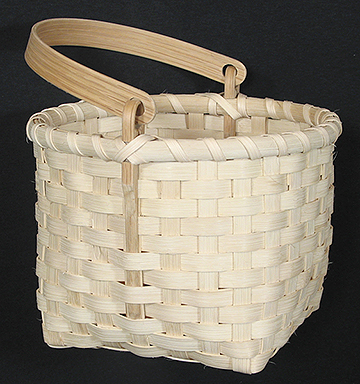 It's a basic plain weave basket with a beautiful 8" handcrafted White Oak Swing Handle with Ears. When the pattern calls for soaking your Flat Reed, soaking a few minutes in warm water is usually long enough to make reed flexible. Soak the Round Reed and Flat Oval Reed for 5 to 10 minutes in warm water. If reed becomes dry while you are weaving, re-soak or spray until pliable. Do not soak your reed too long; it will become mushy. 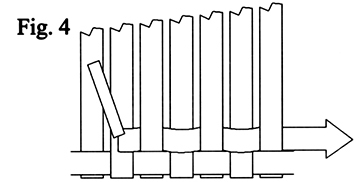 Thickness and flexibility of reed will vary. When possible, use thicker pieces for stakes and softer more flexible pieces for weavers. Flat reed has a smooth side and a rough side. Sharply bend a wet piece of reed in half—the rough side will usually fray or splinter more than the smooth side. 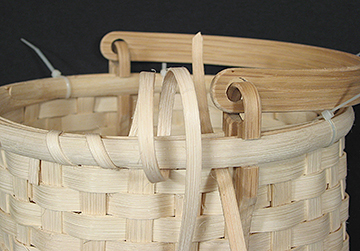 Work with the smooth side of the reed to the outside of the basket. As you weave the base, gently adjust the stakes to keep them in position. Maintain even spaces between your stakes as you weave the basket's sides, pushing or pulling on the stakes as needed. Adjusting the stakes as well as the tension on the weaver will insure the diameter of the basket will be about 8" at the top so the swing handle will fit correctly. When weaving the sides, do not leave spaces between the rows. Reed should be completely dry before being stored. Calculate Supplies for 1 to 20 Kentucky Berry Basket baskets with the Basket Supply Calculator. The Supply List gives you the least expensive way to purchase the supplies for your quantity of baskets. View on-line or print to your printer. Notes: Please read the entire instruction before beginning your basket, and read each step all the way through before beginning that step. Cut 14 stakes 22" long from the thickest pieces of 1/2" Flat Reed. Soak the stakes a few minutes in warm water. Mark two stakes, very lightly, in the center on the rough side of the reed with a pencil. Place a twist-tie around one of the marked stakes and lay the twist-tied stake on top of the other marked stake at a 90° angle, aligning the marks. See Photo. The twist-tie identifies the center of the base. All stakes will be woven rough side up and placed a slight 1/2" apart; as you add each stake to your base, align its ends with the ends of these center stakes. Weave another stake above the center twist-tied stake and one below, placing each of these stakes under the twist-tied stake. Align stake ends. Next, weave 1 stake to the right and one to the left of center; weaving over the center stake and under the other 2 stakes. Space all stakes just slightly less than 1/2" apart and align the ends. Secure with clothespins as needed. See Photo. Continue adding stakes, working outward from the center, until you have interwoven all 14 stakes. 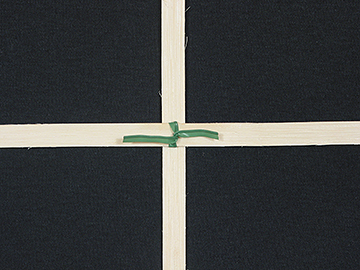 The woven area (base) should measure 6" x 6" with stakes extending about 8" from the edge of the base on each side. Stakes should be equal distance apart; adjust stakes a bit if needed. Double-check your measurements, side to side as well as diagonally, and place a clothespin in each corner. See Photo. Soak the base for about 2 minutes in warm water. Gently "upset the basket" by bending each stake upward at a right angle to the edge of the base (rough side to the inside). See Fig. 1. The stakes may crack and splinter a bit as you crease them. Soak a piece of 1/2" Flat Reed (weaver). This piece should be the most flexible piece available and long enough to weave completely around the basket plus about 4" for overlap. The first weaver continues the alternating pattern (over one, under one) and weaves opposite the outside row of the base. See Fig. 2. Begin the first row by placing the weaver outside Stake 'A' and securing with a clothespin. (Make sure the rough side of the weaver is facing the inside of your basket.) Allow the next stake (Stake 'B') to remain on the work surface and weave above it. Bend the next stake (Stake 'C') upward and place the weaver outside of this stake; secure with a clothespin. When you have woven completely around your basket, overlap the weaver's ends and cut the weaver to fall behind a stake. See Fig. 3. 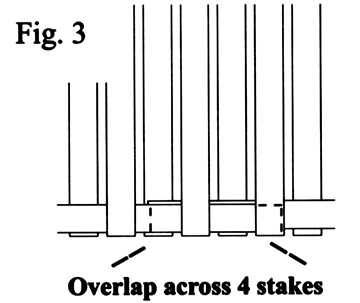 All stakes are shown in their vertical position in Fig. 3 to illustrate hiding the weaver's ends. Start and end the second 1/2" Flat Reed weaver on the side of the basket to the left of the first row start. The second weaver will be outside a stake where the first weaver is to the inside of that stake. See Fig. 4. You will need to shape the basket a bit as you go, creating a round-top basket. It is helpful to make an 8" diameter circle with a scrap of reed and to place this circle inside the basket to check the size after each row. NOTES: To prevent all overlaps from being in the same area of your basket, rotate your basket 1/4 turn counter clock­wise before beginning each row. Maintain an even tension on the weaver and keep stakes an equal distance apart. As you weave, be sure that the lower edge of the piece you are weaving touches the upper edge of the previous weaver, and bend (or weave) the weaver around the stakes. Periodically, place the 8" diameter scrap circle into the basket to gauge the size. 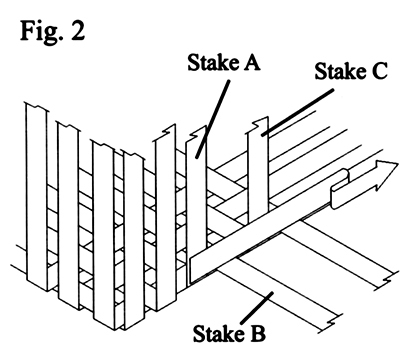 To increase or decrease the diameter, push stakes inward or pull them outward as you weave. Weave a total of 12 rows with 1/2" Flat Reed. Trim a piece of 1/2" Flat Reed lengthwise to make it 3/8" wide. Weave a final row with this narrower 3/8" piece. This row will be completely covered by the rim. After weaving all the rows of your basket, use the bone folder or packing tool and "pack" the rows on the sides tightly together. 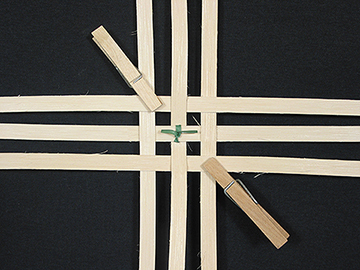 Soak the ends of the stakes that extend above the weavers for a few minutes—do not wet the woven sides of the basket. From the outside of the basket, identify the stakes that are outside the weaver on the top row. Fold these stakes to the inside, creasing at the top edge of the basket. Mark to length, at the lower edge of the third weaver from the top. Trim to length. 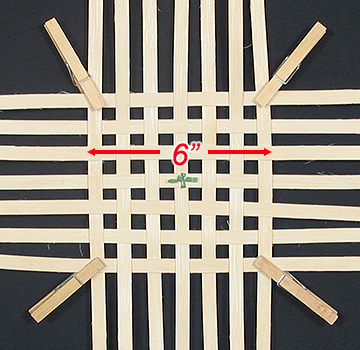 Tuck each folded and trimmed stake to the inside of the basket—over the top 3/8" Flat weaver and under the third row. For easier tucking, use a bone folder or a basketry packing tool. Cut remaining stakes level with the top of the basket. See Fig. 5 view from inside the basket. Place ears into handle. About 3" below the top of the basket, insert one ear of the 8" Swing Handle along a center stake and underneath some rows of weaving on the outside and the inside of your basket. See Photo. Insert the other ear on the opposite side. Use your packing tool to assist you with this step. Note: The top of each ear's notch should be slightly above the top edge of the basket. Measure the outside of your basket around the top row, placing your measuring tape into each ear notch, to determine the basket's circumference. Cut a length of 1/2" Flat Oval Reed 4" longer than the circumference for your outside rim. Cut a length of 1/2" Flat Oval for your inside rim that is 2" shorter than your outside rim. Cut a length of #6 Round for your rim filler the same length as your inside rim. Sand the rounded side of each rim if desired. In order to form a smooth joint where the rims overlap, you must carve some of the thickness from both ends of each rim. Soak the rims and filler for 5 to 10 minutes in warm water then attach the outside rim around the top of your basket (with clothespins) fitting it tightly against the basket, flat side touching the basket. Mark the rim where it overlaps—mark the round side of one end of the rim and the flat side of the other end. Remove the rim and carve the rim with knife or hand plane. Carve the flat side of one end and the round side of the other end to form a smooth overlapping joint as illustrated in Fig. 6. Repeat this process with the inside rim: clothespin it in place (flat side against the basket), mark the overlap, remove the rim and carve the overlapped sections. Trim one end of each rim for a rounded tapered finish. See Fig. 6. Place the #6 Round Reed rim filler through the ears and pin it to the top edge of the basket; mark and carve its ends where they overlap. After carving the rims and rim filler, sand the rounded side of both rims again if desired. Soak rims and filler. 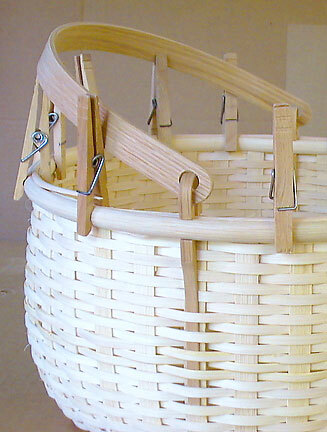 With the flat side of the rim touching the basket, and the overlap falling just beyond an ear, secure the inside rim to the basket with clothespins. Place the outside rim around your basket with its flat side against the basket, overlapping just beyond the inside rim overlap, and clothespin in place. Beginning at your inside rim overlap, place the #6 Round Reed round the top of your basket, going through the ears. Push the Round Reed down between the inside and outside rims. Secure rims and filler to basket with cable ties or twist ties every few inches. See Photo. With a wet piece of 1/4" Flat Reed, begin lashing in a space between stakes just beyond the outside rim overlap. (Be sure to orient the 1/4 " Reed so that its smooth side will be to the outside of your basket.) Secure one end of the 1/4" Flat Reed under the inside rim, beneath the #6 Round, and under the outside rim as shown in Fig. 7. Working left to right from the outside of your basket, bring the longer end of the 1/4" Flat Reed over the rims and between the next two stakes from the outside to the inside of the basket just below the bottom of the rims. Pull one arm's-length of Reed through to the inside of your basket. Now, insert the lashing's end between the next two stakes and pull it to the inside until you have a small loose loop of Reed around the rims. 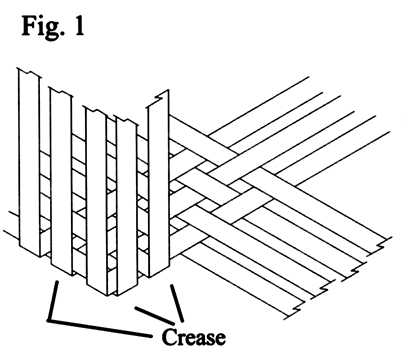 After making three or four loops around the rims and between the stakes, tighten the loops of Reed—one at a time— from left to right by pulling to the inside. See Photo. Repeat the looping process working your way around the basket. If the Reed becomes dry, simply soak it again before continuing. Remove the ties as you progress. Make a backstitch at the handle on each side of your basket. (See completed basket photo.) 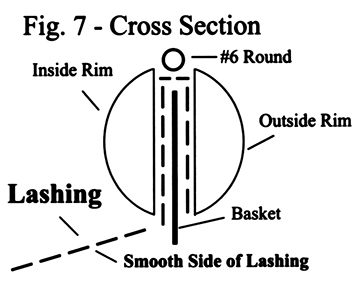 When your lashing reaches the place it began, you will conclude this step by first tucking the end of the lashing behind a weaver on the inside of your basket, and second, folding the end upward over that weaver and behind another weaver. Trim the end. See Photo. Gently shape the rims if needed. Enjoy your Kentucky Berry Basket! After finishing the top edge of your basket by cutting and tucking the spokes (stakes), insert the tapered ends of the ears (legs) behind the weavers along a spoke both on the inside and outside of your basket. See Photo. 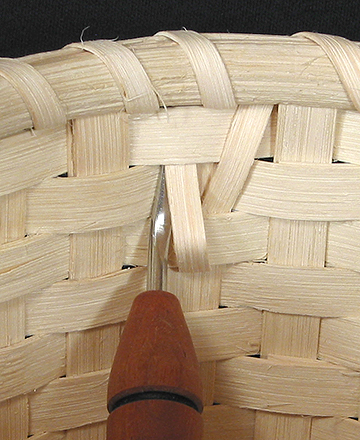 Your basket should be mostly dry to make it easier to slide the legs of the ears behind the weaving. The bottom of the ear notch should be even with the bottom of the top row of your basket. Notice that the ears slide behind the weavers about 2 inches from the top of the basket. Your 1/2" rim material will fit into the notches of the ears. 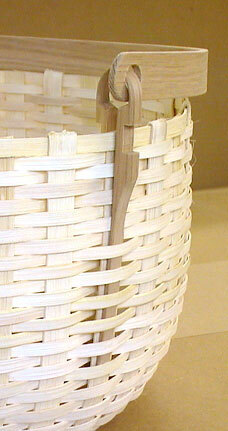 Photo shows a 1/2" Half Round rim on the outside of the basket and a 1/2" Flat Oval rim on the inside of the basket. The rim filler (in this case - #6 round reed) is placed between the legs of the ears. The rims and rim filler are overlapped using a scarf joint. The notches may be made larger to accommodate wider rim material. With a coping saw or small hand saw simply re-cut the notch. Make the new cut on the lower part of the notch. 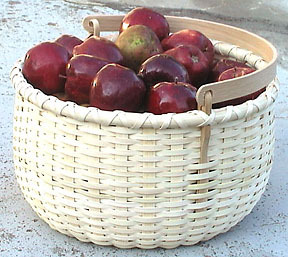 Photo shows a completed Apple Basket with Swing Handle. Swing handles are a wonderful way to enhance the beauty of round, oval and rectangular baskets.